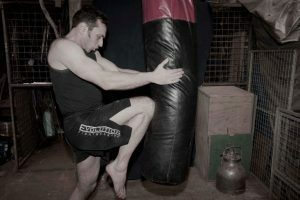 Tuesday night completed my client’s Basic Muay Thai for Martial Arts Cross Training course. We worked through all areas covered during the course and used the round format in order to confirm all the material. After a warmup of dynamic stretching and callisthenics, we trained for six rounds on the Thai focus mitts and two rounds of sparring. Round 5 – Various from the previous four rounds plus all basic elbow strikes introduces and kick-catch counters. Round 6 – Various from the previous five rounds plus set-ups for back-kick and spinning elbows. The lesson finished with some static stretching exercises. My client’s next course will focus on wrestling/stand-up grappling.